Recently, my daughter and I were walking through our local toy store and we came across Puppy Surprise! Talk about a blast from the past. 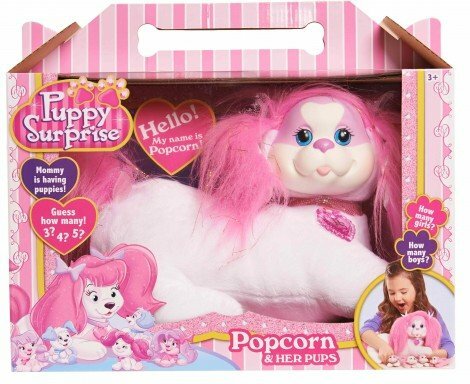 I had a Puppy Surprise as a young girl and was excited to see that this cute toy had made a comeback. My daughter was absolutely delighted to hear that “mom” had this toy back in the day. She was enamored with the mommy and baby puppies and was very curious as to how many babies each mommy had. She immediately announced that this was one of the #1 toys on her Birthday Wish List this year. A few weeks later I was presented with the opportunity to review Puppy Surprise and, of course, I said yes! It was so much fun to be able to revisit my childhood with this adorable toy. My family received Popcorn and her puppies. I’m happy to report that Puppy Surprise is still highly adorable, huggable and of great quality. Mommy and puppies are soft and just as cute and endearing as I remember (perhaps even more so now that I see them through my daughter’s eyes). My favorite thing about this toy is its simplicity. The little act of guessing how many babies mommy puppy has is fun in and of itself. Each Mommy comes with 3 to 5 puppies. You may be wondering how many babies our sweet mama had. Well, if I told you I’d spoil the surprise! Pretend Play and Mommy/Baby role play are very popular with my children and, as such, this toy is such a perfect fit for them. I see countless hours of pretend play with mommy puppy and her babies in our future. I would recommend Puppy Surprise for young children and especially for my little animal lovers. Puppy Surprise mommies are Popcorn, Sugar and Zoey. I’ve also seen Kitty Surprise (available at select retailers) for the little cat lovers out there! PS – Please do price comparisons before purchasing a Puppy Surprise or Kitty Surprise. I’ve seen prices ranging from $24.99 all the way to $60. Toys R Us seems to have consistently reasonable pricing on both Puppy and Kitty Surprise. Disclosure: I received product to facilitate this review. All opinions are my own and those of my children. Additionally, this post contains some affiliate links. If you choose to purchase after clicking on a link then I will receive a commission. Thank you for this income for my family.